The E.B.O. (Expel the Boys Operation) is underway, and the Shadow Student Council is doing everything they can to trip up our intrepid heroes! The boys will have to steel their hearts, minds, and bodies if they want to survive their time in prison. Kiyoshi’s valiant attempt to escape prison to go on his date with Chiyo has ended in failure, landing the boys a one-month extension on their sentence. However, Kiyoshi’s brave stand in resisting his coerced expulsion with the help of Chiyo has raised the ire of Shadow Student Council President Mari, who is now determined to expel the boys once and for all. The council puts the E.B.O. into operation as Vice-President Meiko slowly begins wooing Shingo into spying on the rest of the boys in exchange for favours. Now rewarded by occasional trips into town, it appears as though a little bit of romance might be in the air for Shingo when he meets the beautiful and sassy Anzu on one of these trips. Meanwhile, Hana has returned and is determined to make Kiyoshi pay her back for accidentally peeing on her. With all of these looming threats, Kiyoshi and the boys prepare to do their utmost to prevent their expulsion. The beginning of the E.B.O. results in Prison School’s plot speeding up significantly, and I really enjoyed the focus this volume displayed. There are multiple plot threads being juggled as this volume begins: Hana’s obsession with Kiyoshi, Shingo’s increasingly complicity with the student council, and the struggle Vice President Meiko has in trying to win Mari’s affection. These plot threads each develop in their own hilarious way, delivering plenty of enjoyable moments before coming together to propel the main plot of the Student Council trying to expel the boys forward in a meaningful way. While the story is relatively simple, I really enjoyed the way that the stories of each of these characters were overlaid, each revealing bits and pieces of the main plot before coming together in a dramatic conclusion. 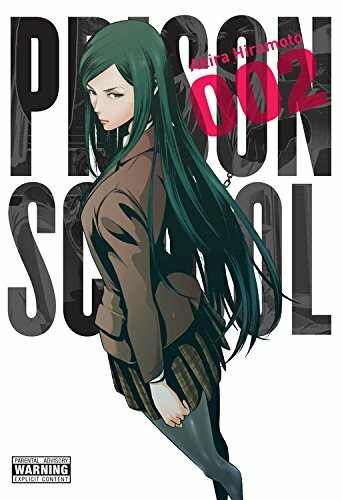 This was definitely the most invested I’ve been in the actual plot of Prison School thus far, and I’m really liking the narrative force that this series is beginning to develop through the use of all of these characters. One of the best parts of the previous volume was the way that it begun developing the rest of the cast outside of Kiyoshi, and I wasn’t disappointed in the least in the way this carried over into this volume. This volume marked the first time that each of the boys felt like they each had their own role in the plot, with Shingo, Andre, and Gackt getting significant time devoted to them. Both Andre and Gackt experience significant pressure as the E.B.O. proceeds, resulting in a number of hilarious scenes that make full use of this series’ almost farcically intense tone to accentuate the ridiculousness of it all. Andre’s chapters in particular are hysterical in following his slow decay as a result of being denied “punishment” by Meiko. The art portrays his spirit slowly being sucked out of him with intense detail to nail the humour involved, and similarly Gackt’s moments of strife were rendered with typical dramatic flair. I enjoyed that it felt like we knew a little more about what makes these characters tick after each of these scenes, and it was entertaining as always to see the series embrace the sheer absurdity of everything and everyone involved. Shingo’s storyline was perhaps the strongest as he is drawn deeper into helping the student council in order to get time out of prison to visit Anzu. His escapades turn out to be unsurprisingly hilarious, but more than that I enjoyed the character development that he received. He felt like a more fleshed out character by the end of the volume, and I really liked seeing his slow change in character over the course of this volume. However, the best part was seeing the way that Gackt, Andre, and Shingo’s stories play into the larger plot, ultimately culminating in another hilariously overdone confrontation with the Shadow Student Council. 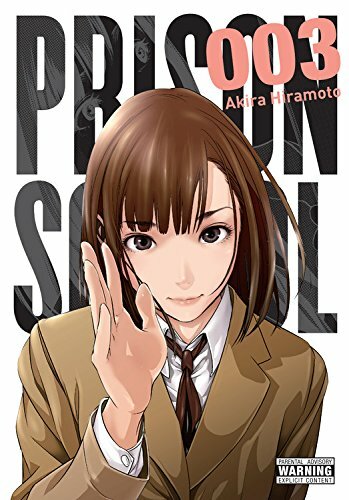 This gave the plot more substance, and even if their primary motivations are a desire to see a wet T-shirt contest, the characters at Prison School have their desires so hilariously illustrated that they feel better characterized than those of other series which attempt more serious subject matter. This gave the plot a solid underpinning as it moved along, and I can’t wait to see what happens next to our crew. While this volume adds a significant amount of substance to the storyline by characterizing a number of the other supporting characters, I wasn’t really a big fan of how Meiko’s story line was done in general. 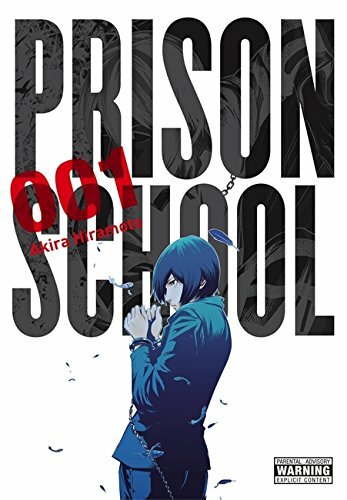 The sexuality in Prison School tends to be used cleverly to make a dramatic point or for comedic relief when combined with this series’ utter seriousness, but when chapters are dedicated purely towards Meiko the story takes a needlessly pandery turn that ends up distracting from the rest. For example, I’m not sure I needed almost a full-chapter of Meiko hanging from a door-knob by her thong struggling to get out of that, because scenes like that were neither funny or cleverly done in any way. I get that Meiko is supposed to shock the reader because of how explicitly she’s portrayed, but three volumes it’s getting a little bit tiring that this isn’t being used for a better dramatic or comedic purpose the way the rest of this sexuality in this series is. That said, her story line ultimately ends up linking into the plot in a decent way, but it felt like there was a lot of fluff there that slowed down the pace without good reason. The art in this volume continues to be uniformly excellent, perfectly complementing the various story beats portrayed. Perhaps the standout sequence in this volume art-wise was the slow starvation of Andre by the Student Council, because we see him rendered with an increasing amount of detail to signify his mental state. The rest of the volume is excellent as well, and creator Akira Hiramoto does a create job using shadow in panels to make each scene that much more dramatic no matter how insane the actual events are. The wonderful “theatre of the absurd” vibe which gives this series so much tonal uniqueness continues strongly in this volume thanks to the art, and I really enjoyed the way that Hiramoto was able to dial up the art to an even more dramatic level when the story called for it. Prison School Vol. 3 is a strong continuation of the series, and I really enjoyed how it added some more substance by layering the different stories of these characters together in a way that culminated in a thoroughly satisfying finale. The humour was in good form as usual from this series, and although Meiko’s chapters were a little bit too pandery I felt this volume moved with excellent pacing in integrating the comedic relief into the plot well. It was also nice to see the wider cast starting to get characterized, and as I continue to become more invested in the struggles of these characters I can’t wait to see how they’ll wiggle their way out of their latest predicament. Prison School Vol. 3 was published by Yen Press on March 22nd, 2016 and is an omnibus version of volumes 5 and 6 of the Japanese release. Authored by Akira Hiramoto, the series began in 2011 is still ongoing in Kodansha’s Young Magazine. Volume 4 consisting of volumes 7 and 8 of the Japanese release will be published in English on July 19th 2016. An anime adaption produced by J.C. Staff is ran during the summer season of 2015 for one cour.